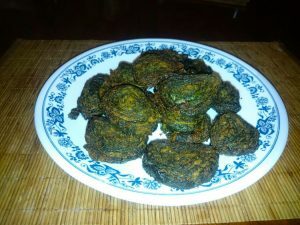 Saina is an unusual crispy green leaf snack served with chutney. Remove the stalk and big veins of the taro leaves. Mix the mung bean flour and water until you have a thick paste. Then add the rice flour, chopped pepper, cumin, chopped garlic, salt and mix into the paste. Apply the paste to the vein side of each of the 4 leaves and stack the leaves on top of each other. Make two rolls of 4 leaves each: roll tightly while folding the sides inward. Optional: tie with a thread to hold the leaf roll in place while steaming. Cut the rolls in slices of 1 - 2 cm and deep fry the slices. 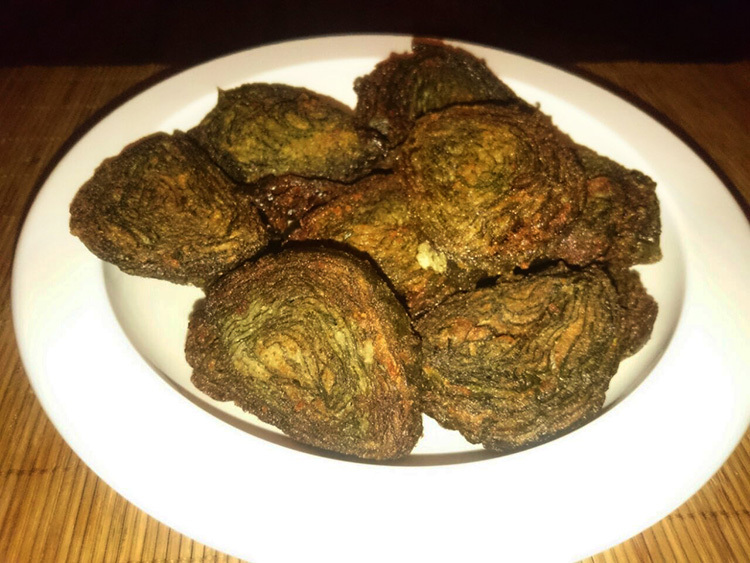 Serve the saina hot with a tomato or green chilli chutney or another sauce that you prefer to dip it in.